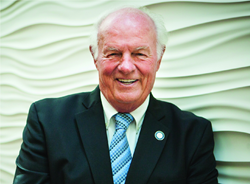 T. Denny Sanford is the visionary behind a nationwide network of Institutes founded by National University -- and including the Sanford Institute of Philanthropy at JFK University. The John F. Kennedy University Sanford Institute of Philanthropy and the Tesoro Foundation are pleased to announce philanthropist and entrepreneur T. Denny Sanford will be a keynote speaker at a Nov. 15 Symposium – Building Outrageously Successful Nonprofit Organizations – that is co-hosted by the University and sponsored by the Tesoro Foundation. Mr. Sanford is considered to be one of the world’s most generous philanthropists, and he has donated more than 1 billion dollars to causes he supports nationwide ranging from education to nonprofits. Mr. Sanford is the namesake of the Sanford Institute of Philanthropy at JFK University, launched earlier this year as part of a national network of Institutes that are based on Mr. Sanford’s vision and approach toward helping nonprofits improve fundraising and donor relations through seminars and educational programs. Each Institute offers curricula developed by the founding Institute, the Sanford Institute of Philanthropy at National University, and presentations by recognized community nonprofit leaders, members of academia, and philanthropic leaders. Two years ago, Mr. Sanford teamed up with San Diego-based National University, a private nonprofit university in California that, like JFK University, is part of the National University System, to develop educational programs that emphasize a Cause Selling approach that strengthens donor relationships. The Cause Selling approach, as envisioned by Mr. Sanford, applies business and sales principles that position nonprofits with making the right ask for causes that are important to them. This approach has been detailed in a one-of-its kind textbook, Cause Selling: The Sanford Way. Since the launch of the founding Sanford Institute of Philanthropy at National University in 2014, affiliate Sanford Institutes of Philanthropy have been created at Augustana University serving the South Dakota region and Bellevue University serving the Nebraska and the western Iowa region. Each Institute, including the one at JFK University, offers educational programs based on the tenets of the Cause Selling approach and being responsive to the unique needs and challenges facing nonprofits in each distinct community. At JFK University, that has included, in addition to sponsoring the Symposium, offering seminars, networking sessions, and webinars. For over 50 years, John F. Kennedy University, a non-profit affiliate of the National University System, has offered undergraduate, graduate, and doctoral programs that prepare individuals for career success while also engaging the student in personal growth through a commitment to service. Today, the University’s three Colleges provide innovative higher education opportunities to 1, 200 professionals who, despite a full range of life responsibilities, are determined to advance their education and improve their future. The Continuing Education division provides professional development education to more than 2,500 individuals per year. A pioneer of education that integrates theory and practice, John F. Kennedy University and its students touch the lives of more than 30,000 people in Bay Area communities every year through their support of outreach centers and public programs. For more information, visit http://www.jfku.edu. The Tesoro Foundation is a separate, 501(c)(3), philanthropic affiliate of Tesoro Companies, Inc. Tesoro and the Tesoro Foundation are committed to collaborating with our stakeholders to create cleaner, safer, well-educated communities where we operate. We create Shared Value for us and our communities by ensuring our charitable investments serve the communities’ needs, harness our employees’ passions and interests, and align with our business goals. We strategically focus our community investments in three core areas where we can make a positive, measurable impact: STEM education (science, technology, engineering and math), public safety, and environmental conservation and sustainability. For more information, visit http://tsocorp.com/social-responsibility/tesoro-community-investments/.